Ravi Shankar, Master of the Sitar In the latest report for the NPR/National Geographic co-production Radio Expeditions, NPR's Susan Stamberg travels to India to talk with Ravi Shankar, the world-famous sitar guru. Shankar turns 85 this week. The music that I have learned and want to give is like worshipping God. It's absolutely like a prayer. A trio of Shankar's students get a lesson from the master. Ravi Shankar, the renowned master of the Indian sitar, turns 85 on Thursday. He is considered one of the world's greatest musicians, and continues to give concerts, tour, teach and compose. In the latest report for the NPR/National Geographic co-production Radio Expeditions, NPR's Susan Stamberg travels to New Delhi, the capital of India, to meet with the artist. Shankar was already a respected classical musician when in 1966 Beatles guitarist George Harrison studied with him. Harrison later played the sitar on the Beatles song "Norwegian Wood," and Shankar's association with the Beatles made Shankar an international star. Shankar's life-long mission has been to bring the music of the East to Western ears. He understands the challenge, and with eloquence, dash and determination, Shankar took his sitar to Monterey, Woodstock, Carnegie Hall -- and in the process, became known as the godfather of so-called World Music. Shankar's sitar guru taught him that sound is God -- and performing is always a spiritual journey. "The music that I have learned and want to give is like worshipping God," he tells Stamberg. "It's absolutely like a prayer." The musician has created the Ravi Shankar Foundation in New Delhi -- a compound which he hopes will be his legacy. There's an auditorium, a recording studio, space for his archives and walls filled with glossy photos of celebrity friends. In each picture, the handsome, diminutive musician (Shankar is 5'3") smiles broadly. 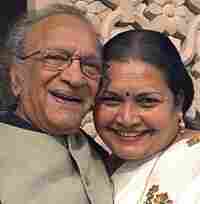 Sukanya Shankar, Ravi's wife, helps to run the foundation. 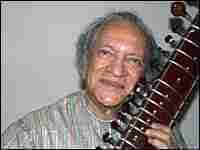 Their daughter Anoushka is her father's sitar disciple, and now a musical partner. Grammy winner Norah Jones is Shankar's daughter by an earlier companion. Shankar is totally in his element when he performs -- sitting on his oriental rug, sitar nestled in his lap, the air scented with incense, he appears lost in a trance. "Ravi Shankar's music is like a fine Indian sari -- silken, swirling, exotic," Stamberg says. "It can break your heart with its beauty."